These pieces of jewelry are one of a kind and are made from our highest quality five face Rudraksha Beads. Each piece is unique and beautiful. Now you can enjoy the spiritual benefits of wearing Rudraksha beads along with any social or business occasion. Just click on the add to cart button below the one you would like to purchase and we will send you the one you choose. 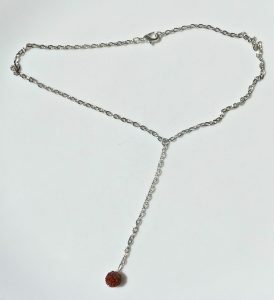 ITEM #1: This necklace is 14″, made in the style of a choker. The brass chain is gold in color. The bead is one 8mm 5 face Rudraksha bead. The price is $20 + $9 SH. 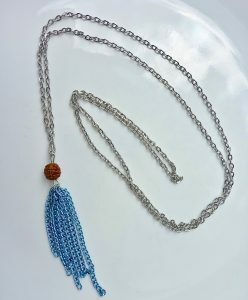 ITEM #2: This necklace is 15″ which will lie gracefully around your neck. The brass chain is gold in color. The bead is one 8mm 5 face Rudraksha bead. The price is $20 + $9 SH. 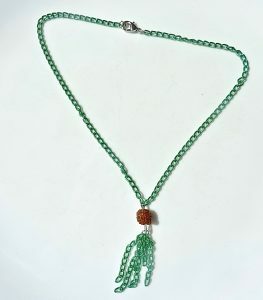 ITEM #3: 14″ inch choker style mala necklace with a tassel, all made from green brass chain.The clasp is silver brass. 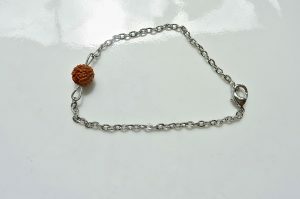 It features one five face Rudraksha bead. The price is $20 + $9 SH. 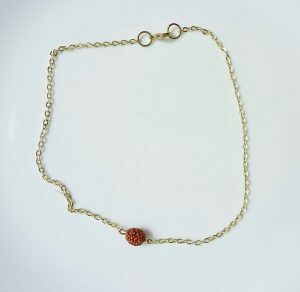 Rudraksha Jewelry #6 $29.00.ITEM #7: 8″ wide bracelet with brass connections, 24k gold plated chain and one five face Rudraksha bead. 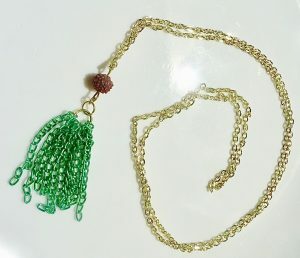 ITEM #8: 20″ long gold brass chain with 6″ dangle ending in a green brass chain tassel. 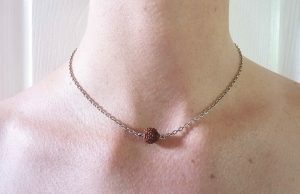 The mala style necklace has one five face Rudraksha bead. The price is $20 + $9 SH. 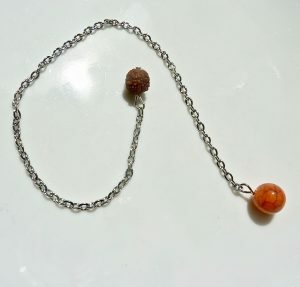 ITEM #9: 9″ long silver brass pendulum with one five face Rudraksha orange plastic bead. The price is $20 + $9 SH. 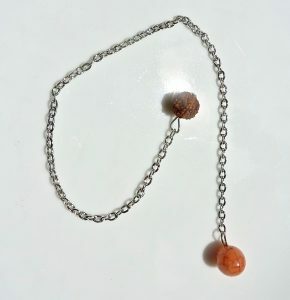 ITEM #10: 9″ long silver brass pendulum with one five face Rudraksha orange plastic bead. The price is $20 + $9 SH. 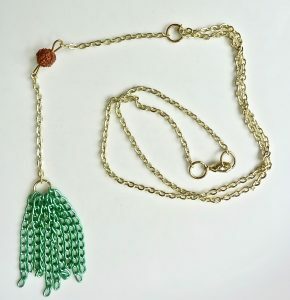 ITEM #11: Gold brass chain mala with green brass tassel. 32″ around 17″ long, featuring one five face Rudraksha bead. The price is $20 + $9 SH. ITEM #12: 9″ long, 18″ around. 24k gold plated chain with gold brass jump rings, clasp and connections. The price is $30 + $9 SH. 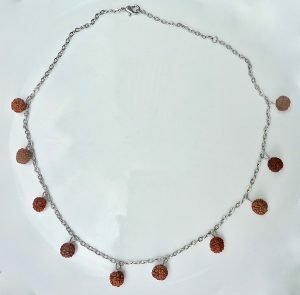 ITEM #13: 14″ long silver brass chain featuring ten five face Rudraksha beads and two jump rings for adjustable length choker style wear. The price is $30 + $9 SH. 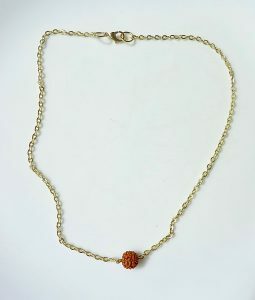 ITEM #14: 18″ long, 36″ around silver brass chain mala with one five face Rudraksha bead and blue brass chain tassel. The price is $20 + $9 SH. 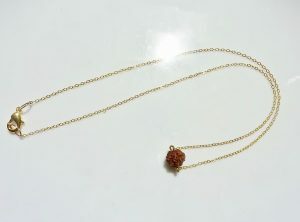 Rudraksha Jewelry #14 $29.00. 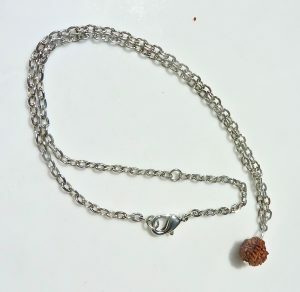 ITEM #15: Silver brass chain choker with one 5 face Rudraksha bead 16″ around. Price is $20 + $9 SH. 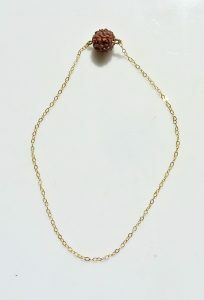 ITEM #16: 29″ long silver brass chain wrap necklace featuring nineteen five face Rudraksha beads. 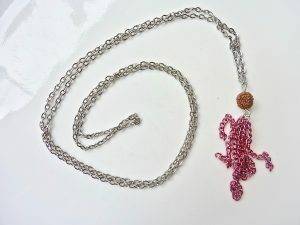 The necklace can be worn as is or wrapped once around the neck for a combination choker and long necklace. The price is $40 + $9 SH.